Spooner Health to Participate in 2019 Statewide Donate Life Wisconsin Flag-Raising Ceremony and Moment of Silence. 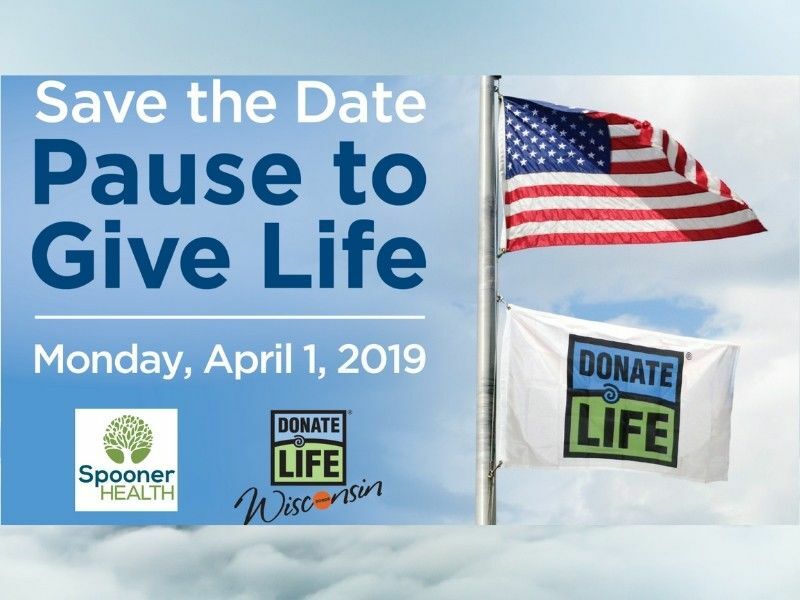 Spooner Health to Participate in 2019 Statewide Donate Life Wisconsin Flag-Raising Ceremony and Moment of Silence Honoring Organ, Tissue and Eye Donors and Families, Monday April 1, 2019 10:08 a.m.
Spooner Health is among the more than 80 Donate Life Wisconsin member and partner organizations that will simultaneously host a statewide Donate Life Flag-raising ceremony and moment of silence to promote the mission of organ, tissue and eye donation, and honor donors and their families. Donate Life Wisconsin created the inaugural Pause to Give Life event in 2018 as a statewide observance to occur annually on the first Monday morning of April marking the start of National Donate Life Month. Monday, April 1 at 10:08 a.m. to highlight the fact that one donor can save eight lives followed by a moment of silence for 1 minute and 14 seconds to recognize the nearly 114,000 patients waiting for a life-saving transplant. Of those patients, nearly 2,000 are right here in Wisconsin. Immediately following the ceremony, please enjoy cookies and refreshments in the Spooner Health Dining Room. The Donate Life flag was first introduced in 2006. Since then it has become a national symbol of unity, remembrance and hope, while honoring those touched by donation and transplantation. During the past 13 years, 50,000 Donate Life Flags have flown across America. Save and heal lives. Register as an organ, tissue and eye donor at DonateLifeWisconsin.org or at a Wisconsin DMV Service Center. Donate Life Wisconsin (DLW) is a nonprofit alliance of organizations and caring individuals dedicated to increasing donated organs, eyes and tissues to save and heal lives. Through education and advocacy, DLW inspires people to register as donors and works together to create a culture where donation is embraced as a fundamental human responsibility. Anyone age 15 and half or older can register as a donor regardless of age, health, gender or ethnic or racial background. Nearly 3 million, or almost 60 percent of those eligible, have said “Yes” and registered as organ, tissue and eye donors on Wisconsin’s Donor Registry. There were nearly 150 living kidney and liver donors, more than 200 deceased organ donors, more than 900 tissue donors and more than 1,500 eye donors in 2018.